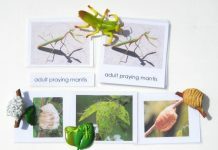 Home Reproductive Biology How Many Babies does a Praying Mantis have? 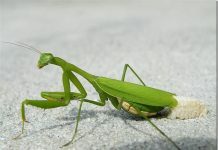 Praying mantis lays a minimum of 100 eggs. All these eggs are hatched at once so the parents must have greater responsibility to feed young mantises immediately right? That isn’t quite true because the female mantis dies after laying eggs. 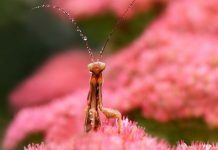 The female mantis is known to produce 100 to 200 eggs sometimes even more than that. Some of the bigger species such as Chinese mantis female can lay up to 300 eggs over a period of few weeks. 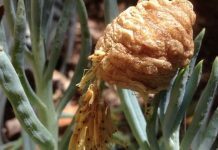 The mantis’ eggs overwinter and they are mostly hatched in April or May. All these eggs remain pretty safe inside the ootheca (a hard-shelled protective case). As the spring arrived, young mantises will begin to emerge from the eggs, all at once. 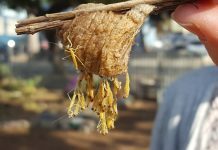 One cannot observe newborn mantises unless juveniles come out of the ootheca. The reason why hatching occurs in April is because the food is abundant in spring. Young praying mantis come out of ootheca one after the other and as they manage to crawl out of the shell juveniles jump to the ground. After jumping they will look for food into the green vegetation. That’s how all baby mantises survive without even their parents nurturing them. 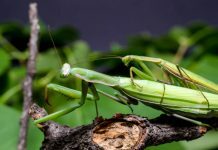 Do Praying Mantis Die After Laying Eggs?